Banting House often receives visitors from all over the world – it is a place of pilgrimage for those who have and those who research diabetes. Banting’s life and legacy have had a truly international impact, and for those whom they affect, Banting House is a place of worldwide significance. This week, I had the opportunity to show around a very special group from Thailand who had come halfway around the world to see Banting House. Both daughters were doctors, and one had recently graduated as an endocrinologist. For her graduation trip, she had chosen to come to Banting House in Canada to see the house of the man who discovered insulin. The family was so excited to see everything in the museum, and the tour was so meaningful to them. Frederick Banting was and will continue to be an inspiration for these girls and many others like them who strive to find a cure for diabetes. All the tours I have given since I started working at Banting House have been great, but this one was the most memorable I have given so far. It is tours like these that remind me how important the National Historic Site I work at really is – Banting’s life and discovery, exhibited in his house, have an international impact and legacy. He was a great Canadian, but was also part of a larger global community. Banting was the recipient of numerous international awards including the Nobel Prize, a knighthood, the Rosenberg Gold Medal, and the Carnegie Corporation Medal. The discovery of insulin was at the time internationally significant, and continues to remain so. 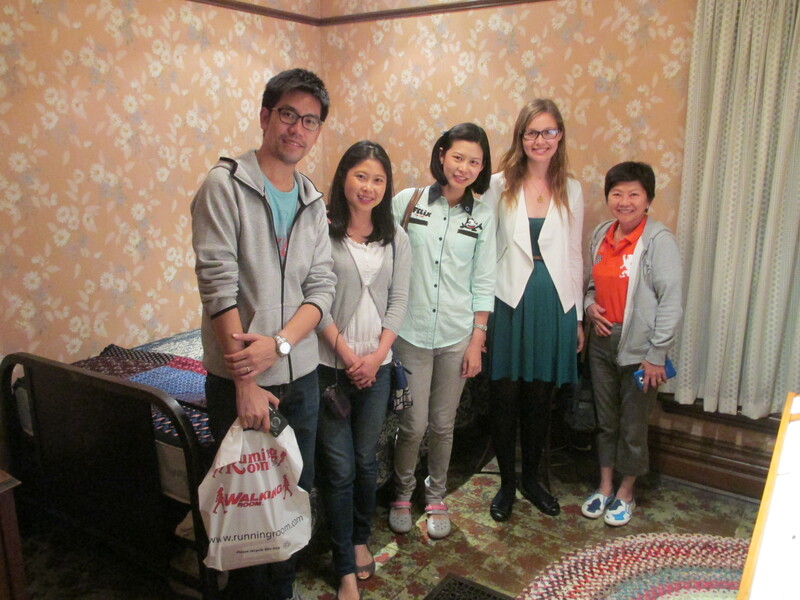 The Ruangnapas, Sitasuwans (visitors from Thailand) and I in Frederick Banting’s bedroom. This week, I have come to truly understand that Frederick Banting’s life and work is meaningful not only to Canadians, but to the world. He is a ‘giant’ of the scientific world, as an international traveler once told me, and his gift inspires people everywhere to continue his work. I am honoured to work in a place that has such a huge influence in the lives of so many people. Visiting Banting’s house was so excited and inspired, not only for us but also my teacher here in Thailand. Thank you very much for lots of information you’d given to us. This trip will be most memorable trip for us too. Amazing! Definitely on my travel list! Next Post Taking the Lead at Banting House!